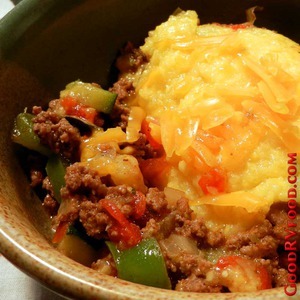 This recipe is a delicious southwestern twist on shepherds pie. The name is inspired by the Navajo town of Shiprock in the north west corner of New Mexico where they raise sheep. The Navajo use sheep for food and fleece. This is why so many of the traditional Navajo recipes have mutton and why Navajo weavings are wool. Personally I don't much like the flavor of mutton so I substitute beef but turkey or almost any ground meat works. This is a perfect recipe to test your creative side. 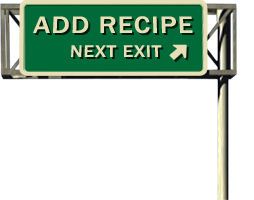 Try adding items like sliced mushrooms, kernel corn, pinto beans, chopped carrots or other veggies. I find the combination of taco seasoning with Rotel brand Tomatoes and Green Chiles to be that just right place between too bland and too spicy. Use a little less or more of these to adjust the spice to fit your taste. In a sauce pan cook the polenta according to package directions. It should end up about the same thickness as mashed potatoes. While the polenta is cooking sauté the vegetables in a small amount of oil until just slightly tender. Add the ground meat and taco seasoning to the pan and cook stirring occasionally until almost no pink remains. Add the Rotel Tomatoes and Green Chile with all of the juice and simmer to reduce and concentrate the flavors. When the polenta is cooked, remove from heat add the cheese and stir to melt. To serve scoop meat and vegetable mixture into a bowl and place a mound or two of polenta on top. Enjoy. Leftovers keep well in the refrigerator for up to 3 days and reheat nicely in the microwave.